I spent the half-term in the loo. Well actually, I didn’t, but it felt like it. What I actually did was spend time trying to entertain my two gorgeous kids and nine times out of ten ended up going to the loo constantly over the course of those days entertaining. We went to the zoo. It was over £20 to get in. We spent most of it going from one end of the zoo to the other; to get to the only toilet located by the entrance. There was a wonderful parrot that said “Hello” to us on the way past the first time. By the time we went past for the third time, he didn’t say anything. I think he was as bored as I was. In other words, if you have kids, wee-ing becomes an expensive, and VERY annoying business. It seems that my two kids are playing toilet tag most of the time. We go to the loo for one. We finish while the other is staring at shiny sinks and listening to the other singing merrily in the cubicle. We do the usual, “Are you sure you don’t need a wee?” to the one that didn’t go. They are sure they don’t, so we go out and head back to where we were experiencing the joys of Zebras at the other side of the zoo. Thirty minutes later, without fail, we are back; as the other one that didn’t need the toilet now does. And repeat as many times as you like – probably minus the Zebras. So we spent at least a quarter of our zoo trip in the toilet. We should have got a discount. Even the parrot thought so as it squawked “back again” when we went past it for the fifth time…. Do you have the same problem with trips out? Are you always having to traipse to the loo? Do you have a solution? If you do, would LOVE to hear it! 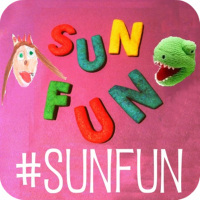 This is a #SunFun Linky post – so pop on over to the lovely Mammsauruas to join in the fun today. Pingback: Parenting: Help – I think I just invented the iPoo! LOL – note to self – check out how many toilet sites the attraction has when planning trip – the more the better! Oh yes, I remember. Makes me feel good that my two have finally grown out if this (aged 9and 7). Now I’m as likely as any to be the weak bladdered one, but at least it’s usually only once per trip…..
Oops – that was an interesting typo! Oh yes the lure of the unfamiliar toilet! We cant go out for a meal without having to spend 75% of the time going back and forth to the loo…grrr! Take them before you leave homeand then when you arrive.Keep drinks at a minimum and everyone drinks at the same time.I have 3 kids around the same age so I understand your pain. As our Ellie would say: “Oh dear dear…”! Ours are about ready for potty / toilet training, so I guess we have this to look forward to: thanks for the warning! Yes and even though i have only one daughter sometimes it feels like when we are out most of the time in the toilet when we are out! and I am sure you do too! I can absolutely relate to this! Great days out huh? The zoo toilet as fab – as was the park one, the soft play one…and so on!